Do you know what an Economic Crunch is? If you said it was a flavor of ice cream, you would be right! Actually, it is a discontinued flavor once sold by Ben & Jerry's ice cream company. In this lesson you will find out why the Economic Crunch is no longer a flavor and why Ben & Jerry's has to keep choosing which flavors to keep selling–and which ones to bury in their Flavor Graveyard! You are going to write a letter to the stockholders of your pretend video game company. You will explain, using economic words, why your company has decided to stop making one of its games. Apply the economic terms, scarcity, productive resources, and entrepreneurship in analyzing a real company. Explain why choices have to be made. Ben & Jerry's History: This page provides the company history of Ben & Jerry's ice cream. At this page you'll find out how the entrepreneurs Ben Cohen and Jerry Greenfield built their company from a $12,000 investment. Ben & Jerry's Flavor Graveyard: Besides being a little spooky, the site offers reasons for dropping flavors and gives us clues about how producers have to make choices. Ben & Jerry's Flavors: For a list of the flavors of ice cream that Ben & Jerry's now sells use this page. Quiz: This will evaluate students reading and comprehension of the lesson. People who make goods and services are called producers. These producers use land, labor, and equipment to make a product that consumers want. Land, labor, and equipment are productive resources, sometimes known as natural, human, and capital resources. Entrepreneurs are people who take the risks to bring goods and services to the market. Now that you have finished reviewing those economic concepts, let's apply them to a real company. Let's take a good that almost everyone likes. Let's scream, scream, for ice cream! Ben & Jerry's is famous. If you would like to do so, you can read the history of Ben & Jerry's. There you'll find out how the entrepreneurs Ben Cohen and Jerry Greenfield built their company from a $12,000 investment. Ben Cohen and Jerry Greenfield are the entrepreneurs who took the risk to open up an ice cream store. They are the ones who got the money, found the place, developed the recipes, and opened the store. What was risky about this? They could not be sure that their store would sell enough ice cream to pay them back for all the costs involved in getting the business started. Did they get their $12,000 back? Well, you be the judge. Last year there were 756 people working at Ben & Jerry's, there were 337 Ben & Jerry's stores, and the company gave away over a million dollars to various charitable causes. The Ben & Jerry's company must make choices. It now sells only 50 flavors of ice cream. In settling on these 50 flavors, however, it has tried and discontinued more than 50 other flavors. Why would Ben & Jerry's discontinue any flavors of ice cream? Why can't a rich company that makes millions of dollars make all the flavors it has developed? Scarce resources – that's why! Why should Ben & Jerry's use its time, labor, and equipment to make the Sugar Plum flavor, for example, when it could be using all those resources to make the Chocolate Chip Cookie Dough flavor instead? You see, the Chocolate Chip Cookie Dough flavor is Ben and Jerry's second-best seller, while the Sugar plum was not a big seller. Every time Ben & Jerry's uses its resources to make a flavor that very few people will buy, it takes resources away from the production of other flavors that ice cream buyers might prefer. As you go through the site, list all the resources that the Ben and Jerry's Ice Cream Company uses to make ice cream. Are there enough resources to make ALL the flavors that the ice cream company has developed? For instance, if it takes a large vat to hold the cream and sugar that are ingredients in ice cream, and a very large paddle that stirs the cream and sugar together, can that vat and paddle be used to make ice cream and sorbet (rhymes with Norway) at the same time? Sorbet is made with fruit and water or milk instead of cream. No, the company has to choose which kind of product to put in the vat and stir. Put a star on your list by the resources that cannot be used to make the discontinued flavors AND the present flavors at the same time. To test your knowledge of what you just read, take this fun quiz. Visit the Ben & Jerry's Graveyard and see the burried flavors. All those reasons made Ben & Jerry's choose to use its resources for popular flavors. 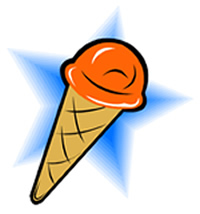 For a list of the flavors of ice cream they provide, go here . In this lesson we have applied the economic concepts of scarcity, productive resources, and entrepreneurship to an analysis of Ben & Jerry’s ice cream company. Scarcity affects the choices a producer makes, even when the company is making millions of dollars. Pretend you are an owner of a company that makes video games. Write a letter to your stockholders (people who own shares of your company) and explain why you are going to stop making a game called Game Under Fire. Use the correct economic words–including entrepreneur, productive resources, and scarcity–to explain your decision.